NAF D-Ty is a nutritional supplement for the support of healthy muscle tissue and function in horses. Although there are many reasons for poor muscle health, a build up of toxins and lack of vitamin E are common problems which can cause muscle damage or lack of performance capabilities. 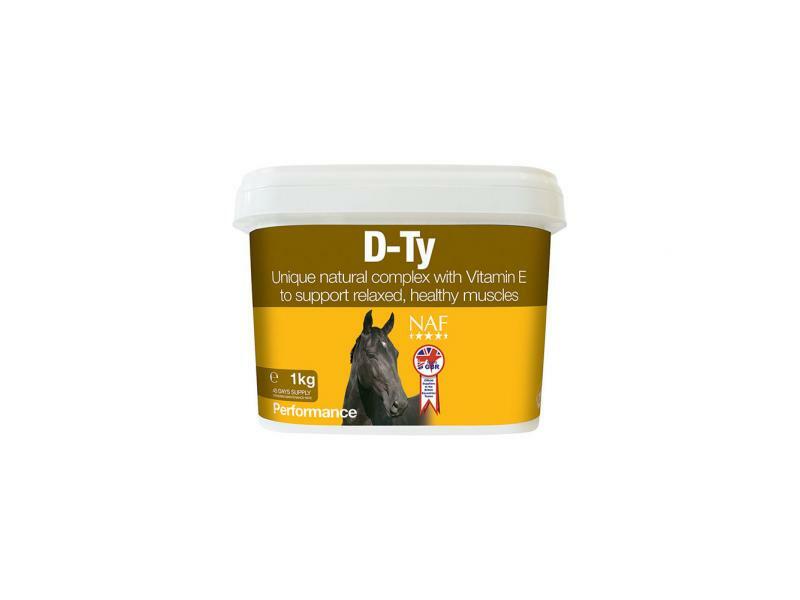 NAF D-Ty is rich in antioxidants to flush toxins, vitamin E and essential trace elements which help to ensure that the horse's muscle requirements are being met. Brewers' yeast, Omicha berries, Sunflower seed, Methyl sulphonyl methane (100,000 mg/kg), Cramp bark, Black Cohosh, Bitter orange peel (ripe), Carrot (dried), Rosehip shells, Ginger, Thorowax, Dandelion leaves, Milk thistle seeds, Turmeric, Angelica, Skullcap, Tomato pulp, Hawthorn berries, Gingko leaves, Rosemary, Blueberries, White mineral oil, Licorice, Red sage, Fructo-oligosaccharides, Apiculture by-product (bee pollen), Wheat protein. Maintenance levels may be adjusted to suit the individual and are not necessarily related to bodyweight. There are currently no questions for NAF D-Ty for Horses - be the first to ask one!